See all the game graphics and items in this issue by clicking this link. 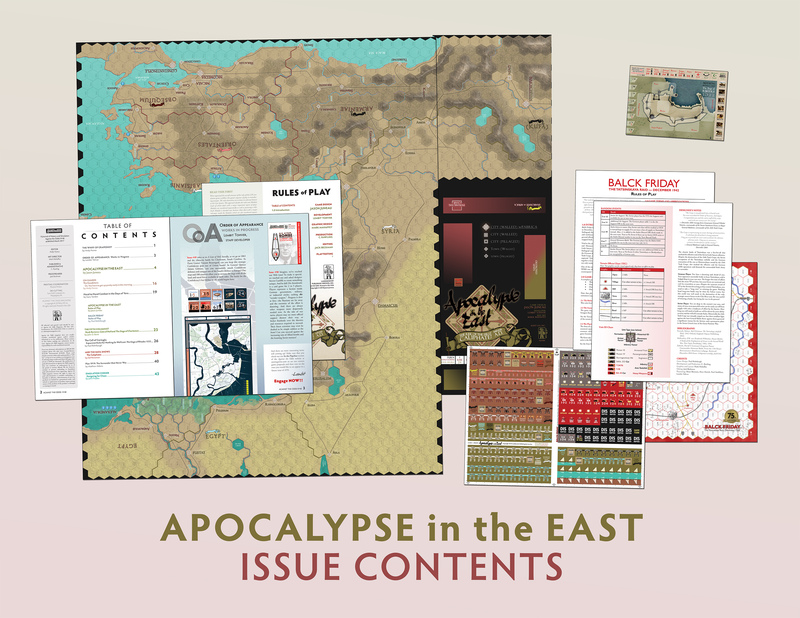 Download the rules for Apocalypse in the East (in PDF format). Make the ATO 2017 Annual part of your subscription! Six Days of War, designed by Paul Rohrbaugh, examines the event of 50 years ago where Israel launched pre-emptive attacks against the neighboring Arab countries that had vowed to destroy her… and won. It changed everything. And yet, it also established a kind of stasis in which little seems to have changed in those subsequent 50 years. How can that be? It was a war fought with a mixture of weapon types that ranged from the very latest jets to leftover WW2 equipment… yet reached a decisive conclusion in less than one week. With today’s “little wars” that drag on year after year, the idea of a real conclusion in just a week—with a declared winner and losers—staggers the imagination. Six Days of War comes with 180 full color, die cut counters representing Israeli and the various Arab states involved in the fighting, with a 22" x 34" color map divided into THREE distinctly different battlefield areas, covering the Sinai Peninsula, the West Bank, and Galilee/Golan. Ground units are mostly brigades and regiments while air units (with extensive coverage of the many plane types) represent 24 to 36 planes. Each full game turn equals one day, with 10 turns as the maximum possible time. Sign up for yours today when you subscribe, or with your next re-subscription.